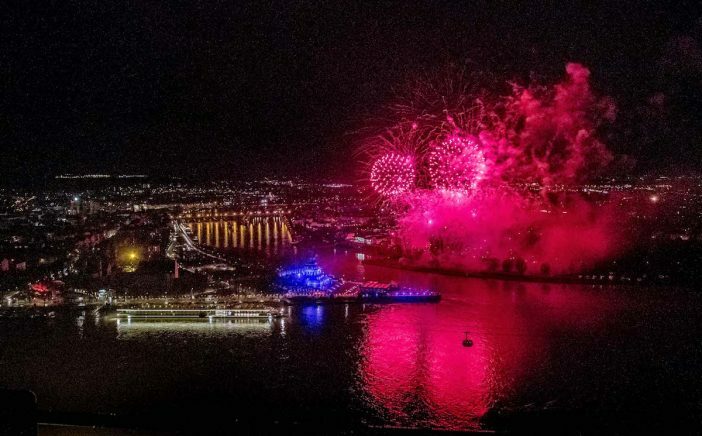 Viking River Cruises christened two river cruise vessels in Germany yesterday, Viking Hild and Viking Herja, with a spectacular ceremony also marking 20 years in the business of offering river cruises. The line’s river cruise fleet now numbers more than 60 vessels around the world. Viking Hild will sail the river Rhine this spring on a new Paris to the Alps itinerary and later this year both ships will sail Viking’s Danube Waltz and Rhine Getaway itineraries. The Longships were christened in a joint ceremony at the confluence of the Rhine and Moselle rivers in Koblenz. Award-winning British composer and conductor Debbie Wiseman is godmother to Viking Herja. Wiseman is currently Classic FM Live’s composer in residence and she has composed a signature piece of music for Viking’s 20th anniversary, which will premiere at Classic FM Live at the Royal Albert Hall on April 18. Godmother to Viking Hild is Dr. Princess Stephanie Löwenstein-Wertheim-Rosenberg, chief executive of Weingut Fürst Löwenstein, a family-owned and top-rated winery in Lower Franconia. Viking Longships on the Main River sail past Schloss Löwenstein, and guests can tour the estate and winery with a Privileged Access excursion. Fürst Löwenstein wine is also offered to guests on Viking river and ocean cruises. Until June 30, 2017, Viking is offering £1,000pp discount on 2018 river cruises. The eight-day Rhine Getaway starts from £995pp.